Today's Summer Card idea comes from Guest Designer Deb Risko. The Ink-Spirations love to share what they have been cookin' up in their stamp rooms. Nothing says summer better than butterflies and sunflowers. Deb layed the foundation for her card with the Sunflower Background stamp. She heat embossed her sunflower to give it extra depth. Basic Black on So Saffron adds the look of the summer sun. Her pop up butterfly is from the Papillion Potpourri stamp set. And her Itty Bitty Banner waves her Thank you for everyone to see. It may be summer time, but some of you are already thinking holiday cards. There are a number of Popular Holiday Stamp sets not in the catalog that have carried over. Make a Congratulations Card with a punch of humor. It's a cute card that can be whipped together in just minutes. The Chevron Embossing Folder and Washi Tape set the stage for this cute card. The inside was stamped with the Congratulations stamp from the Sweet Salutation stamp. Sweet Salutations is one of 3 popular Greeting Stamp sets that is 25% off through June 30. Hurry Offer ends tomorrow. Our focal point tag was cut with the Chalk Talk Embosslits. And our Giggle Greetings stamp was colored with Bermuda Bay and Calypso Coral Markers. From Flower to Butterfly Punch Art Tutorial. Get double the uses from your Flower Shop Stamp Set and Pansy Punch. They say a picture is worth a thousand words. Let me show you how a flower changes into a butterfly in less than a minute. Stamp a flower from the Flower Shop stamp set. Punch Flower with Pansy Punch. (Available singley or as part of the Flower Shop Bundle). Trim Flower into the shape of a Butterfly. Add a row of Basic Rhinestone Jewels-flower to butterfly in less than a minute. Our butterfly makes a nice addition to our Wildflower Meadow card. 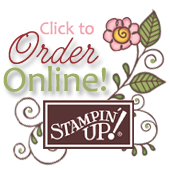 In the 2013-2014 annual catalog, we offer the Stampin' Write Marker New Color Kit (item 130034, page 163) to help you update your Many Marvelous Marker pack. Now, we've sweetened the deal. For a limited time, from June 26 until October 31, you can buy any of the new colors in the pack or on their own! Go ahead, fill in the missing pieces in your collection or buy the whole lot.